Effectiveness cannot be looked at in isolation. It is a system of ‘things’ that ends in a state of efficacy. However, effectiveness only results in efficacy and S.M.A.R.T outcomes, when a significant level of its twin efficiency is attained. Effectiveness is therefore, systemic. The above is the discourse that the Effectiveness lab brings to you from both the individual and organisational perspectives. We ask what makes individuals effective or ineffective; when juxtaposed in the context of either individual culture, personality, genes, and the environment we live in – factors that affect the effectiveness or not of individuals become a complex matter. The discourse on effectiveness and the modern organisation focuses on three types of entity: Civil Society, Private and Quasi-private sector. All the four variables need various levels of orchestration, moreover from a common pedestal, for them to support attainment of the ideal state of effectiveness. That orchestration is equivalent to sustained change management. The four are critical enabling factors. According to the Effectiveness-lab, change management at organisations or in individuals cannot be episodic. Change management is a continuous process, that lives with us 24/7, and constantly manipulates the four enablers above. Private sector organisation – another interest that comes with our interest in what makes organisations effective or even not. The challenges micro-enterprises face in rural Africa are of particular interest. This is all augmented by our past as consultants for various private sector companies. The quasi-private sector organisation – We like to indulge in value chains of social-development organisations, that combine entrepreneurial and social-development thinking. What makes them, and concurrently at that, successful charities and businesses? 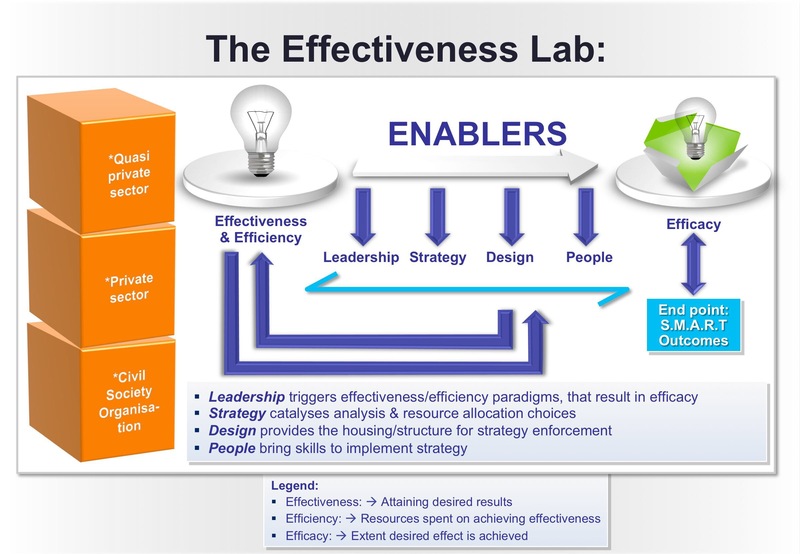 If effectiveness is the ‘capability to produce the desired result’; and efficacy the ‘extent to which the desired effect is achieved’, effectiveness and efficacy, unlike efficiency, are about ‘achievement’ and not the ‘resources spent on achieving effectiveness’. Therefore, you may be effective but not efficient – a bit confusing is it not? Well, welcome to the Effectiveness-lab, together, we shall get to the bottom of everything effective. Awesome!!!! Is it possible to effective beyond self (civil ,cooperate) when one is a fail privately? Gabazira, I have come to visit your blog. As one of the Tanzanian worked under your supervision just for few months, I’m so excited to see your contribution beyond your daily office work that is so demanding but yet you can think sharing your thoughts in this developing world. I hope this blog will provide actors in developing world context with some facts from the ground that will contribute toward re designing or reshaping the intervention towards poverty eradication. Dear Revo – thanks for visiting the blog and taking time to read content there of. Welcome to read all future blogs!